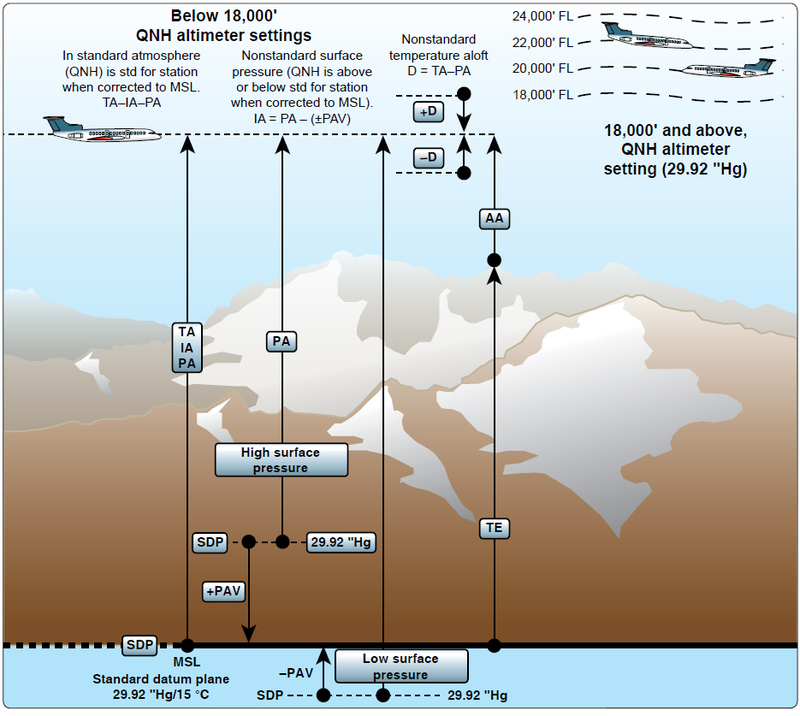 Altitude may be defined as a vertical distance above some point or plane used as a reference. Knowledge of the aircraft altitude is imperative for terrain clearance, aircraft separation, and a multitude of operational reasons. There are as many kinds of altitude as there are reference planes from which to measure them. Only six concern the navigator: indicated altitude, calibrated altitude, pressure altitude (PA), density altitude (DA), true altitude (TA), and absolute altitude. There are two main types of altimeters: the pressure altimeter, which is installed in every aircraft, and the absolute or radar altimeter. 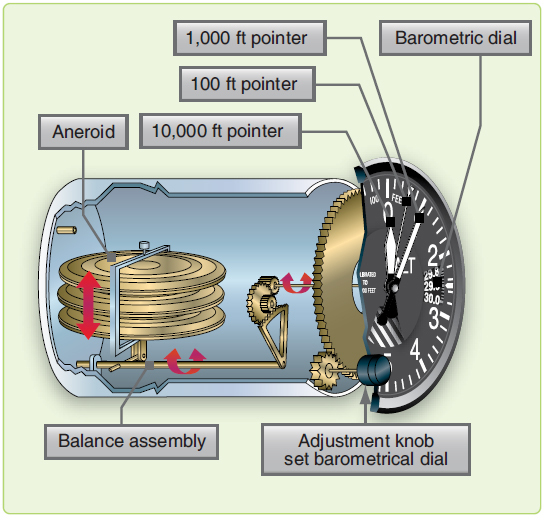 To understand the pressure altimeter’s principle of operation, a knowledge of the standard datum plane is essential. Figure 3-12. Standard lapse rate table. The pressure altimeter is an aneroid barometer calibrated to indicate feet of altitude instead of pressure. As shown in Figure 3-14, the pointers are connected by a mechanical linkage to a set of aneroid cells. These aneroid cells expand or contract with changes in barometric pressure. In this manner, the cells assume a particular thickness at a given pressure level and, thereby, position the altitude pointers accordingly. On the face of the altimeter is a barometric scale that indicates the barometric pressure (expressed in inches of mercury) of the point or plane from which the instrument is measuring altitude. 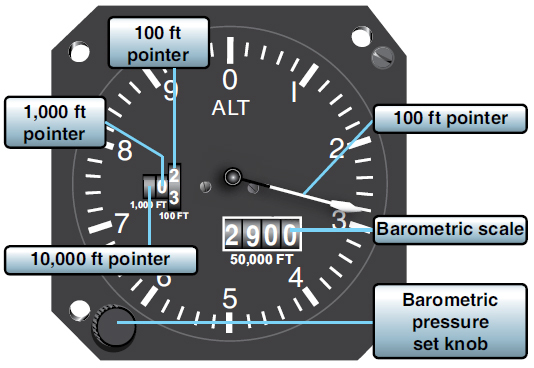 Turning the barometric pressure set knob on the altimeter manually changes this altimeter setting on the barometric scale and results in simultaneous movement of the altitude pointers to the corresponding altitude reading. Like all measurements, an altitude reading is meaningless if the point from which it starts is unknown. The face of the pressure altimeter supplies both values. The position of the pointers indicates the altitude in feet, and the barometric pressure appearing on the barometric scale is that of the reference plane above which the measurement is made. Figure 3-14. Altimeter mechanical linkage. The counter-pointer altimeter has a two-counter digital display unit located in the 9 o’clock position of the dial. The counter indicates altitude in 1,000 foot increments from zero to 80,000 feet. [Figure 3-15] A single conventional pointer indicates l00s of feet on the fixed circular scale. It makes one complete revolution per 1,000 feet of altitude change and, as it passes through the 900- to 1,000-foot area of the dial, the 1,000-foot counter is actuated. The shaft of the 1,000- foot counter in turn actuates the 10,000-foot counter at each 10,000-feet of altitude change. To determine the indicated altitude, first read the 1,000-foot counter and then add the 100-foot pointer indication. 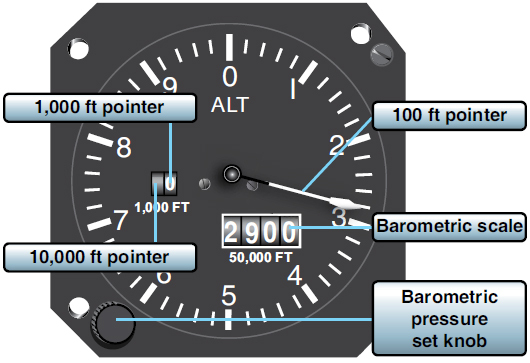 It is possible to misinterpret the counter-pointer altimeter by 1,000 feet immediately before or after the 1,000-foot counter moves. This error is possible because the 1,000-foot counter changes when the 100-foot pointer is between the 900- and 1,000-foot position. Aside from the familiar circular scale and 100-foot pointer, the counter-drum-pointer presentation differs somewhat in appearance from the present three-pointer altimeter. Starting at the left of the instrument illustrated in Figure 3-16 and reading from left to right, there are two counter windows and one drum window (white). The numerals presented in the counter windows indicate 10,000s and 1,000s of feet, respectively. The drum window numbers always follow the pointer number, thereby indicating 100s of feet. Figure 3-16. Counter-drum pointer altimeter. Read the two counter indications, without referring to the drum, and then add the 100-foot pointer indication. The 100 foot pointer serves as a precise readout of values less than 100 feet. The differential air pressure that is used to operate the counter-drum-pointer altimeter is processed by an altitude transducer where it is converted to electrical signals that drive the indicator. The transducer is also used to send digital signals to a transponder for purposes of automatic altitude reporting to Air Route Traffic Control Centers (ARTCC). A standby system is available for use if an electrical malfunction occurs. In the standby system, the altimeter receives static air pressure directly from the pitot-static system. When the instrument is operating in the standby system, the word STANDBY appears on the instrument face. A switch in the upper right-hand corner of the instrument is provided to return the instrument to its normal mode of operation. This switch may also be used to manually place the instrument in the STANDBY mode.